The site is located on the north eastern corner of Langstone Harbour which is a Site of Special Scientific Interest (SSSI), Special Protection Area (SPA), candidate Special Area of Conservation (cSAC) and a Ramsar Wetlands site. 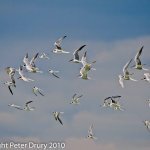 The Harbour is home either permanently or on a migratory basis for tens of thousands of seabirds, which find that the thousands of hectares of intertidal mudflats contain a massive assemblage of marine invertebrate life. This is located on the site of the 1864 South of England Company Oysterbeds, and is owned by Havant Borough Council. The RSPB currently manage this site on behalf of the council. This comprises parcels of land, mainly to the East of the Hayling Billy Trail, and the Trail itself. This is owned by Hampshire County Council and managed by the Council’s Countryside Service. The aim of the Hayling Billy Heritage Project is to support both Local Nature Reserves as one, regardless of ownership. Following the closure of the railway, Havant Urban District Council purchased the Oyster beds and the railway land. The site to the west of the railway line became a household waste dump (now known as the ‘tip field’) and highways depot. In 1974 ownership of the ex railway land and the ‘tip field’ was transferred to Hampshire County Council (HCC) and tipping ceased. Havant Urban District Council became Havant Borough Council (HBC) and retained ownership of the old Oyster bed land. In 1980, a company approached HBC with plans to restore shell fish farming at the Oysterbeds. Planning permission was granted but the works were never completed and the company ceased trading in 1987. The incomplete works presented HBC with a dilemma. 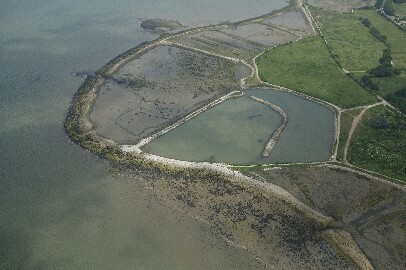 The outer walls of the oyster beds were incomplete and did not meet with the planning permission that had been granted. These works were considered unsafe and contained material that would have to be removed. The public were using these for walking over despite fencing being erected and notices warning of the risks. To compound this, funding was not available from Council’s budget to carry out any work to correct the issues. An application was made to the EEC for funding under the “Life” Programme which if successful would have seen the site reorganised, but ultimately this proved unsuccessful. The Council realised that to do nothing would expose it to increased risks and the cost of removing the unwanted material would continue to increase. A Planning Application was prepared in 1994 to remove the unwanted material and return the embankments to the condition of the 1970’s. To complete the application, finance was found to employ Adams Hendry, Chartered Town Planners and Environmental Consultants of Winchester to carry out an Environmental Impact Assessment (EIA). The EIA was necessary because the site is located in Langstone Harbour with its International designations. The scope covered all possible solutions to the issues including processing and transportation of unwanted material off site. Planning Consent for the outline proposals to completely remove the alien material was obtained in September 1995. The Consent carried a large number of Conditions covering enabling and temporary works, programming, environmental measures relating to noise, mud and dust, aftercare and management as have been described. A non-contractional partnership was set up with Hampshire County Council, English Nature, RSPB and Hampshire Wildlife to safeguard the environmental issues of the work. Invitations to tender for the work were issued at the end of 1995. H. T. Hughes and Sons (Transport) Ltd of Fareham offered to carry out the works at no cost to the Council. A second Planning Application was to covering the methodology by which Hughes intended to carry out the works. This was approved in 1996 allowing work to be started 1 Nov 1996 and was substantially completed in May 1996. This was very successful and remains so today. This project was awarded a Millennium Product. This was the former site of the household waste land reclamation tip which was cleared and given over to meadow land. The above will be changed when more information comes to hand. Any further historical information and archive photos about the Hayling Billy Nature Reserve would be very welcome. Subject to information received, I shall change the title.